- from Gerald P., CDx3 Notification Service subscriber, April 9, 2015. See more preferred stock investor reviews here. The ten highest quality preferred stocks that are selling for a sub-$25 market price are offering income investors an average 6.4 percent Yield-To-Call in today's preferred stock marketplace. Allstate Insurance Corporation (NYSE: ALL) has a $28.5 billion market capitalization and offers five traditional preferred stocks and one Exchange-Traded Debt security for the consideration of preferred stock investors. ETDs are very similar to preferred stocks and are often labeled as such on brokerage statements. But ETDs are recorded on the company's books as debt, rather than equity, and are actually bonds that trade on the stock exchange (rather than the bond market). As debt, ETDs are often considered to represent lower investment risk than the same company's preferred stocks. Allstate’s ETD carries a Baa1 Moody’s rating (two notches into investment grade territory) while the company’s five traditional preferred stocks are rated Baa3 (bottom of the investment grade scale). 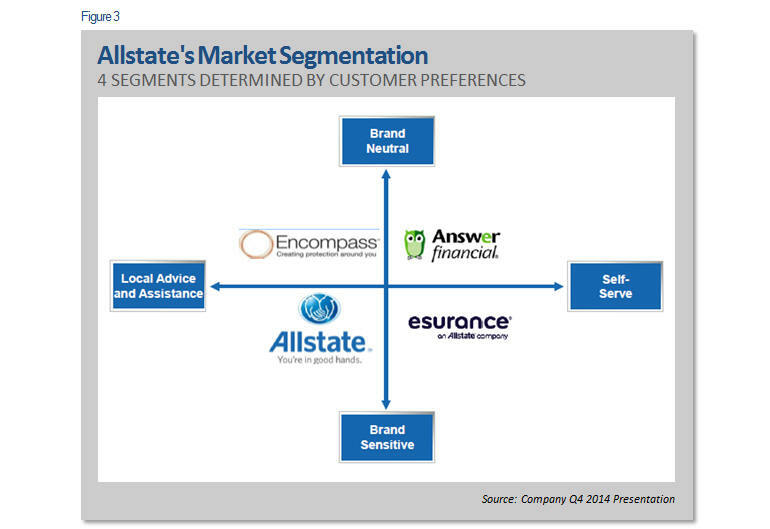 Allstate delineates their market along two customer-focused characteristics, creating four distinct market segments – (1) the preference for full-service versus self-service and (2) those that prefer a specific brand versus those who are less brand-sensitive. This strategy, while comprehensive, presents challenges as the company continues to adjust their approach to finding the balance between policy growth and profitability. While the full-service Allstate brand accounts for 90 percent of the property liability premiums collected by the company, management clearly recognizes the need to expand into the self-service area, acquiring online insurer Esurance in late-2011. But here is the dilemma: Policy growth is being primarily realized by the self-service (internet) segments, with Esurance reporting a 2014 policy in force (PIF) growth of 12.6 percent over 2013. But this same segment realized a 2014 recorded combined ratio of 117.7 (the combined ratio is the amount paid out in policy expenses divided by the amount collected in premiums, a value exceeding 100 indicating a loss). Conversely, the full-service Allstate brand segment reported a solid 91.5 combined ratio (profitable policies) for 2014, but an essentially stagnant 2.1 percent policy growth. In other words, during 2014, Allstate’s four-segment business model saw policy growth in the unprofitable self-service segment and stagnant growth in the profitable full-service segment. But because the profitable Allstate brand still makes up the bulk of the company’s business, excess cash continues to pile up. As we have seen with a multitude of U.S. companies lately, Allstate has implemented an aggressive repurchase program of its common shares. Since preferred shareholders are always paid their dividends prior to common shareholders, these cash deployment plans provide a strong measure of assurance to those holding the company’s preferred shares. Allstate issued its $500 million ETD (ALL-B) and five preferred stocks within an eighteen month period, beginning in January 2013 through June 2014, raising a total of about $2.2 billion. Interestingly, this is the same period that the company implemented its 2014 common share repurchase program, spending the same amount - $2.2 billion - throughout the year. This program essentially converted voting shares of common equity into non-voting shares of preferred equity and $500 million in new debt. The return to shareholders, as measured by Yield-To-Call, being generated by each of these six income securities is more than double that being offered by the 1.7 percent current yield of the company’s common shares (the YTC calculation accounts for the capital loss today’s preferred stock buyers will realize in the event of redemption on these securities’ respective call dates). All six of Allstate’s income securities use the calendar quarter as their dividend cycle. The June dividend for ALL-B, the ETD, has already been declared. With the exception of their coupon rates, Allstate’s five preferred stocks (ALL-A, -C, -D, -E and -F) are very similar in their prospectus provisions. All offer five-year call protection (from IPO), investment grade ratings, $25 par values and pay quarterly dividends on the same schedule. And these five preferreds are designated as offering Qualified Dividend Income (see “Tax-Advantaged Preferred Stocks: Does It Really Matter?”). But the stability and diversification benefits that these securities offer must be considered in light of their primary weaknesses. Allstate’s five preferred stocks have non-cumulative dividends and are offering an average below-market current yield of 5.9 percent. 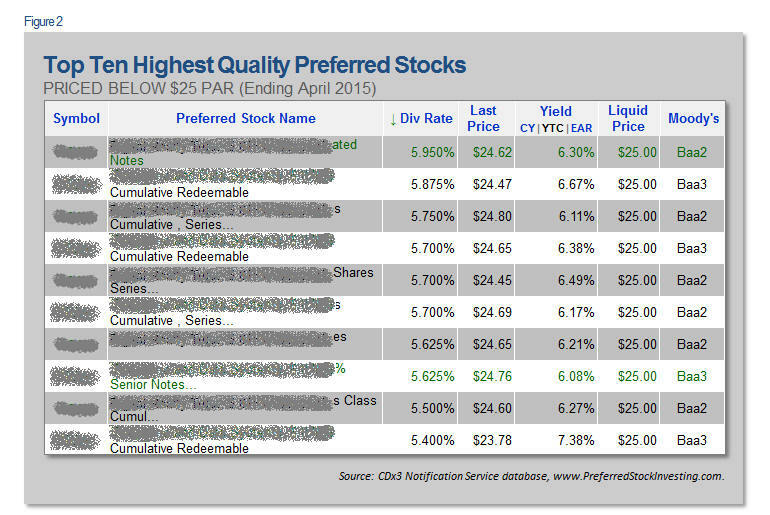 The 27 highest quality, call-protected preferred stocks with cumulative dividends trading on U.S. stock exchanges are currently offering an average 6.6 percent current yield. Also, none of the five preferred stocks have a maturity date so the company is not required to call the shares. And the low coupon rates offered by ALL-A (5.625%) and ALL-F (6.250%) make these two issues unlikely to ever be redeemed (see “Is Your Preferred Stock About To Be Called?”). Further, ALL-B, the ETD, has a fixed-to-floating rate structure, with the variable rate kicking in on this security’s January 15, 2023 call date. Historically, the variable rate structure has rarely benefited preferred stock investors since, once the call date arrives, the shares are usually called if rates have increased (see “Variable-Rate Preferred Stocks Underperform Their Fixed-Rate Cousins”). But even in the face of a changing marketplace, where its primary product is highly commoditized with shrinking brand loyalty and its method of delivery is changing from highly profitable full-service to marginally profitable (or, as yet, unprofitable) self-service, the risk of default is extremely low.